In case the sudden deluge of stories about Sandlot sequels and rough roll-out dates hadn’t already made it abundantly clear, Disney is making a major information push for its new Disney+ streaming service today, timed to its big Disney Investor’s Day event. A lot of the info that’s been trickling out of the company’s social media feeds this afternoon is stuff we already knew or could have expected—users will be able to download movies and shows for offline viewing, the Star Wars films and other Disney Signature highlights will be a major component of the service’s early library, etc.—but the devil, as they say, is in the details. 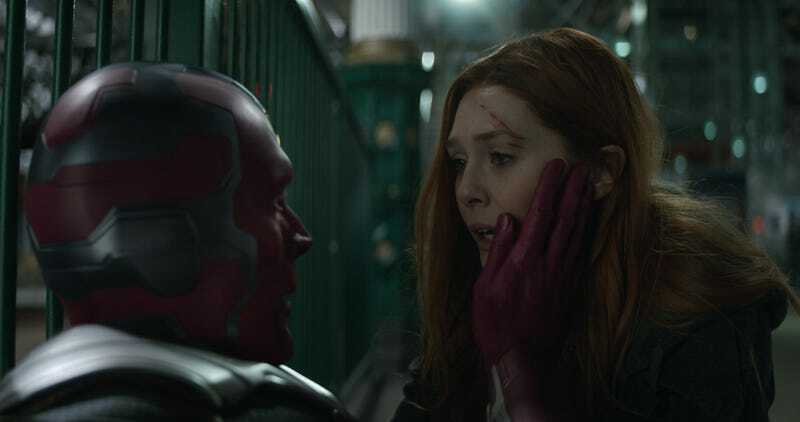 For instance: We were already pretty clear that the company’s early Marvel offerings would include three limited-run TV shows starring MCU actors, namely Tom Hiddleston’s Loki, Anthony Mackie and Sebastian Stan’s Falcon and Bucky, and a third series centered on the Scarlet Witch and the Vision, played by Elizabeth Olsen and Paul Bettany. What we did not know, though, is what these shows would be formally called, and while the first two are rather unexceptional—welcome to the Disney+ team, Loki and The Falcon And The Winter Soldier—the third actually sounds kind of engagingly bonkers: WandaVision. And sure, that little portmanteau is technically just the two characters’ names inelegantly mashed together. But it’s also suggestive of a much lighter tone than what was going down the last time we saw these two lovebirds together, making us wonder: Will this particular Marvel series be getting the full rom-com treatment? Honestly, it’d be fantastic to see Marvel Studios use the freedom afforded by these shows to explore different tones than “Make a quip, yell about a magic rock, throw an energy blast, repeat.” Frankly, the less WandaVision looks like a traditional MCU project the better, in our eyes. If that means they have to bring on a multi-cam set and a laugh track for some fun “Honey, you just phased through the sofa again!” comedy, so much the better.